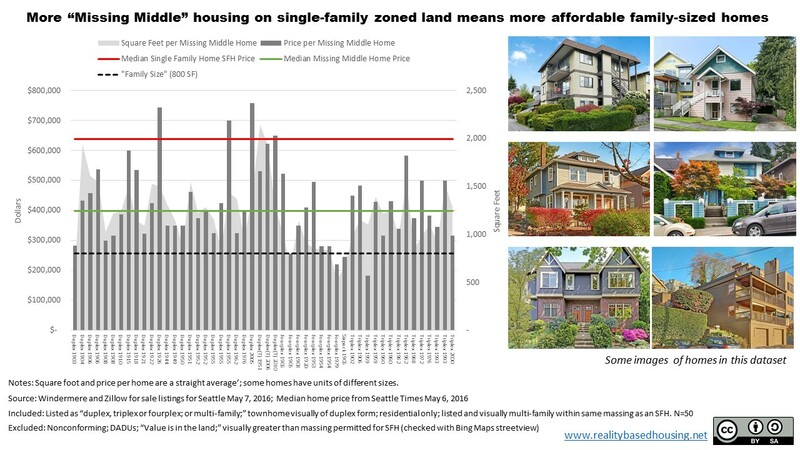 The HALA committee’s recommendation SF2 was to allow multi-family homes like duplexes and triplexes within the same envelope allowed for single family homes in Seattle’s currently single family only zones. These forms were allowed in the past in many areas currently zoned single family detached only. This dataset summarizes all the current listings I could find of duplexes, triplexes, stacked flats and similar forms that would fit within the envelope of a single family detached home in Seattle. Unsurprisingly, homes in the these “missing middle” forms are less expensive than single family detached homes. Most are over 800 SF, already incorporating or allowing for two bedrooms. The median price of one of these homes is $398,738 or 62 percent of the median single family detached home price of $637,250. The chart is labeled and sorted by form (e.g., “duplex,” “triplex,” “duplex (T)” for “duplex townhome” and so on) and by date of construction from left to right.